Enterprise Architect supports a range of features for the development of databases, including modeling database structures, importing database structures from an existing database and generating DDL for rapidly creating databases from a model. With Enterprise Architect you can build database diagrams using the built-in UML Data Modeling Profile. This supports the definition of Primary and Foreign keys, cardinality, validation, triggers, constraints and indexes. By using Enterprise Architect's DDL generation function you can create a DDL script to create the database table structure from the model. (#) - no further development will be undertaken on these DBMSs, due to a general lack of interest for these products from the Enterprise Architect user base. This will allow Sparx Systems to concentrate its efforts on the other areas of Database modeling. 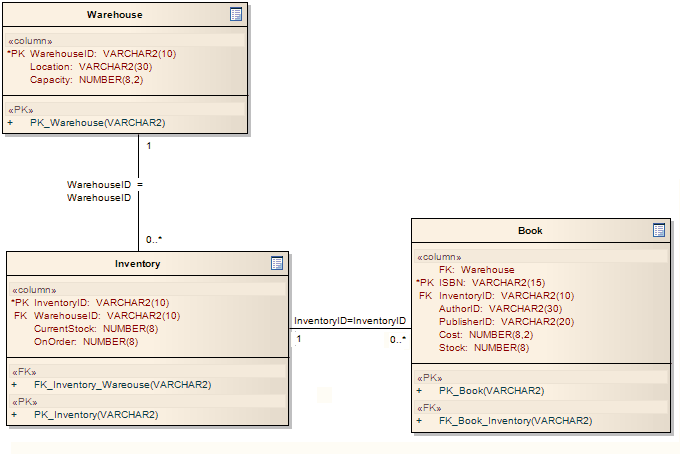 Using an ODBC data connection you can import a database structure from an existing database to create a model of the database. By generating the model directly from the database you can quickly document your work and create a diagrammatic account of a complex database through the graphical benefits of UML.